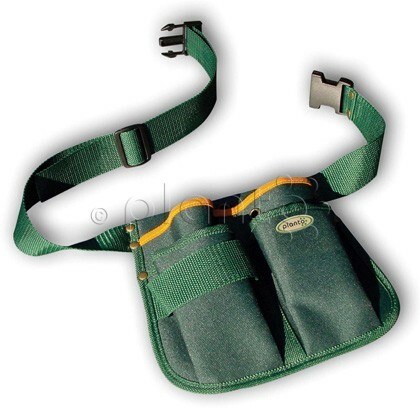 This convenient hard-wearing belt pouch always keeps your garden tools or other garden equipment ready at hand. When working stooped over simply turn the belly pouch to the back. 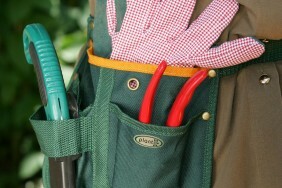 Thus your garden shears and other garden accessories are out of the way but you still have them at hand in the handy belt bag. The small eyelet in one of the pockets is smart: thread the open end of floral wire or tie cord through and leave the rest in the pocket. This way nothing gets tangled and you only pull out the required piece of string. 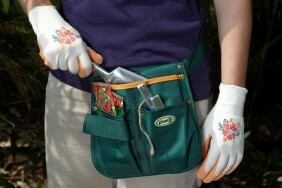 It is also very convenient as a tool pouch for other professions. The tear-resistant material keeps sharp utensils safely in place.